Bud is such a funny puppy! I’ve had so much to do this week, with Thomas away in Norway (leaving me with all the collies) and Nicks arriving on Monday. Bud has mostly worked on his potty training skills and bonded with Nicks. They are so cute together, almost so much that I don’t want them to grow up. Bud is very intense in tugging now, but when I brought food out he was not interested. Here are some clips from today’s session. All sessions are posted to the online foundation class for my students to see. You can still join, we’re only on lesson 1! 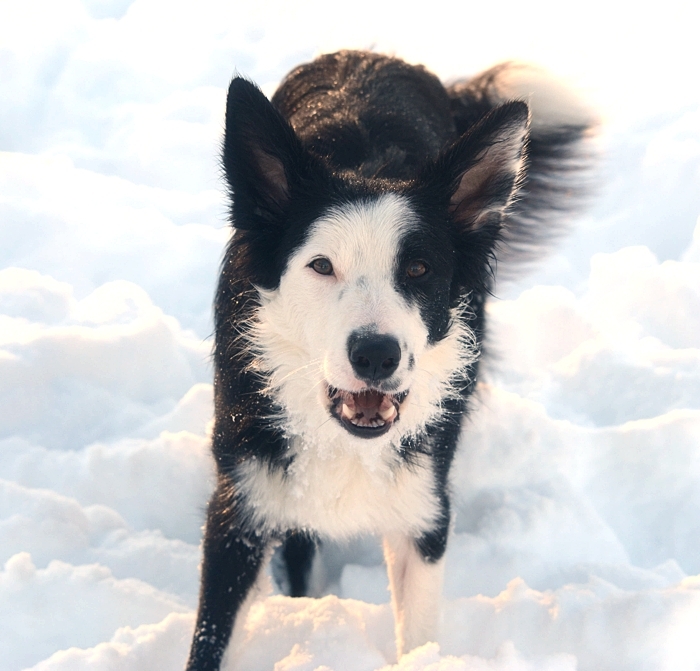 The ice and snow is finally melting, and it’s actually possible to train herding on the bigger fields now. And very soon the roads will be clear. It was worse on Wednesday, when I slipped and fell on my hands while dragging the trashcan down our driveway. My left hand is still bruised and hurting quite a lot. I’m glad that I’ve had friends here all week that have been able to help me out while Thomas is away. 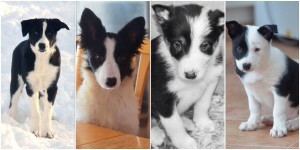 Fay and Epic’s puppies turned 8 weeks on Tuesday, and four of them have moved to their new homes. The fifth one leaves tomorrow, and little Bud will stay with us. I’m very excited about finding out what kind of dog he is. Tomorrow is also the day when my new Scottish puppy Nicks will come to Sweden to join us! She’s 11 weeks, so will probably be a better play partner for Bud than Volt and Leet who are bigger and tougher. So many puppies. Expect lots of fun training videos. Some of the videos will be exclusive for our online classes (and you can still join! ), and some will be saved for later projects, but I’ll post here as well. Bud, my puppy from Fay’s litter with Epic, is 7 weeks and 7 days old today. His siblings will start to leave for their new homes tomorrow. Bud and I had our first session on anything today – a couple of minutes of play and kisses in the living room. Isn’t he the cutest? I don’t really feel motivated to do obedience in freezing cold or on hard or slippery surfaces where she could hurt herself. The time I spend in indoor arenas (all that are heated and with good footing is more than an hour away from here) is spent on agility. So that leaves my living room! I’ve compiled a list of things that I can train at home in a small space, and I’m going to pick a few of them every day. Today was scented retrieve (2 min), long sit stay (2 min) and stand/sit/down from heel with focus on stimulus control (2 min). Here is a video of scented retrieve and stand/sit/down from heel. Sit stay was too boring to include. I was asked why I’m so strict in the scent work, not allowing her to work until she finds the correct item. In competition, they do have a minute to find the correct item, but you can get points taken if the dog sniffs the correct one and then doesn’t pick it up immediately. I’d like Squid to start at one end and be systematic even when she’s aroused. She knows the exercise, so our winter indoor training will be focused on getting all the small details right. 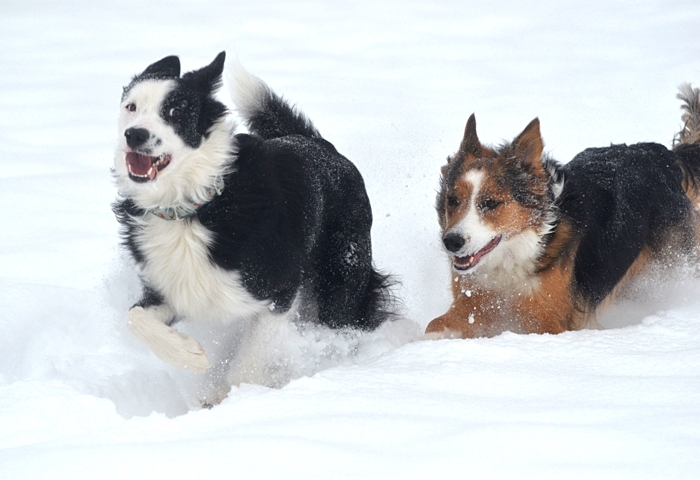 What are your best ideas for indoor obedience training? Please leve a comment and give me some inspiration! Wilco turns one year old today. He is still such a puppy. He hasn’t even started to lift his leg to pee. He is long legged and bouncy. I haven’t done a lot of training with him, there are many things that I want him more physically and mentally mature before starting. I know puppies his age with full height running dogwalks, but Wilco hasn’t started any running yet. I think he’d be too bouncy and immature for that at the moment. We have started to play a little with two low jumps and some tunnels. He jumps nicely and learns quickly, but needs short sessions to be at his best. What I love most about Wilco is that he is so kind to everybody. He gets along with all dogs and all people. I hope he keeps that attitude. He travelled with me when I was teaching a seminar a couple of weeks ago, and he could stay tied to the wall of the indoor arena all day and just be friendly to any dog coming up to him. I also really like that he relaxes well when other dogs are running, playing or working. Just like his father, he can be perfectly relaxed by an agility ring. I’m also very happy that I can ask him to lie down and watch quietly as I run agility with the other two dogs. Having three dogs that you can train without having to put them away between sessions just makes everything much easier. We don’t train as much as I would like at the moment. Thomas is in Norway three days a week, and I have a lot to do with all the puppies and dogs. And we have way too much snow. 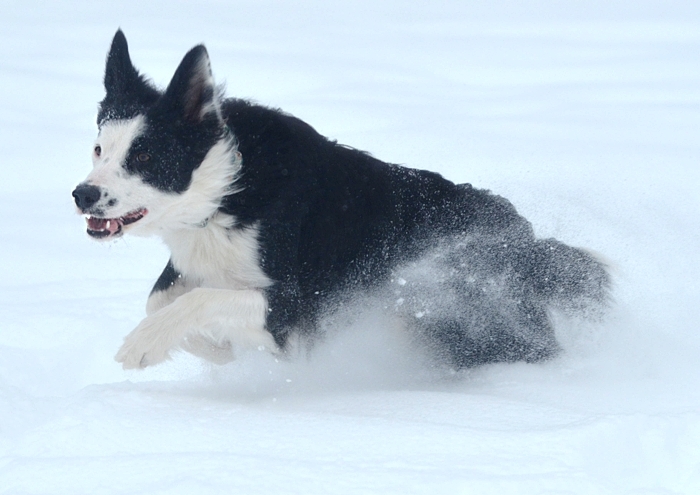 Wilco enjoys running in the snow with his friends, so he’s not too sad about it. I really look forward to spring! But first, we’re preparing tonights birthday party for him and his brother. After an okay December, the end of January has hit us hard with the loss of another beloved young dog. We’ve also gotten a lot of snow and I really, really look forward to spring. A year ago I was driving south through Italy, crying some tears of joy as the warm sun hit my face when I got out of the car. After Win suddenly died, I decided to stay at home this February, which was a good choice considering recent tragic events. But I really, really don’t like the snow and the cold. My dogs are enjoying it (although I’m sure they’d prefer training, just like me), and this video from today brings a smile to my face. In the video is Squid, Epic, Wilco, and the two older puppies – Leet and Volt, on a walk with me. The second part of the video features our 6 week old puppies by Epic having some fun in the snow. I promise to get back soon with some more uplifting training videos!